The newest addition to Green Common's flagship store in Sheung Wan is this beautiful pastel-colored, positively decorated, fully vegan restaurant: Kind Kitchen. Not only does it look like a slice out of an elegantly designed artwork, their motto, "be kind to every kind" - which mirrored throughout the restaurant - is a great reminder of why vegans choose to do what they do. This restaurant is reminiscent of Kynd Community in Bali in that they both preach the message of kindness through veganism, but the set-up of this restaurant is much more spacious and instead of centering their menu on breakfast food, Kind Kitchen offers a variety of dishes to enjoy throughout the day. FOOD: The food at Kind Kitchen covers a multitude of cuisines and offers an interplay between Eastern and Western flavours. This is the first restaurant to introduce a menu that showcases the vast amount of ways that the vegan-based pork, Omnipork, can be enjoyed. They have the traditional Chinese Dan Dan nooodles served with Omnipork, Italian spaghetti bolognese infused with Omnipork and dried tomatoes, Vietnamese Bahn Mi filled with tofu and bits of Omnipork (that are unfortunately quite hard to manage), Japanese Gyozas which also contain omnipork, a Beyond Burger that is differentiated from the usual American burger through its unconventional filling of apple puree and smoky vegan honey mustard, and last but not least, my absolute favorite: the JUST Scramble French toast with a drizzle of agave syrup. Everything on the menu is entirely vegan, and they also sell milk tea using oat milk! All of these dishes are very flexible for sharing, and you can ask the waiters to help you cut the food up into separate portions - which is great. They also have a children's menu which includes a vegan Mac & Cheese, but unfortunately, they do not serve this in 'adult' portions. Personally, I would recommend the French Toast and the Spaghetti Bolognese as my top choices, and I would advise against the Omnipork Gyozas as they tasted rather bland and were much flatter than usual Gyozas which tend to contain more filling. PRICE: All items on the menu are priced at around $50-100 - mains priced higher than desserts and appetizers. The food is quite moderately priced for vegan food in Hong Kong, and the Beyond Burger is cheaper than most Beyond and Impossible burgers in Hong Kong. Compared to restaurants such as Hemingway's By the Bay, the Spaghetti Bolognese is also much cheaper. Kind Kitchen's prices are on par with Confusion Plant-Based Kitchen's, but slightly higher than Loving Hut. 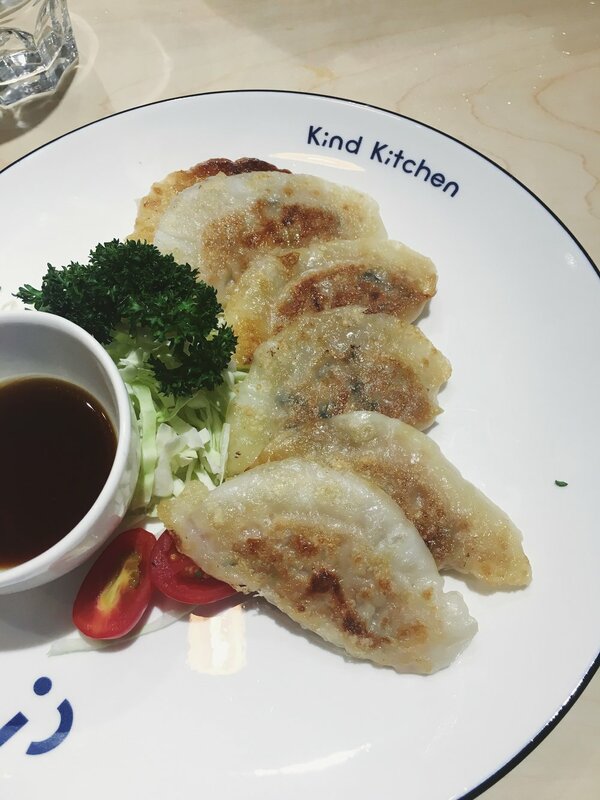 LOCATION: Located on the second floor of Nan Fung Place, Kind Kitchen can be easily reached from Exit E3 in Sheung Wan. OTHERS: This restaurant lends itself to a host of activities including, but not limited to, eating. Aside from the 100 seats available in the restaurant, they also have a VIP room available upon booking which can be used for anything from meetings to parties. As Green Common is conveniently situated directly across this restaurant, once you're finished with your dining, you can head over to do some green grocery shopping - or vice versa! Both the restaurant and grocery store are extremely kid-friendly, and they even have a "Mini Common" to educate younger customers about green living. They offer food in mini sized bites, which makes this dining experience perfect for the family!